Puttin’ Up Banana Peppers— Guaranteeing Our Next Cheeseburger or Hotdog Will Rock! 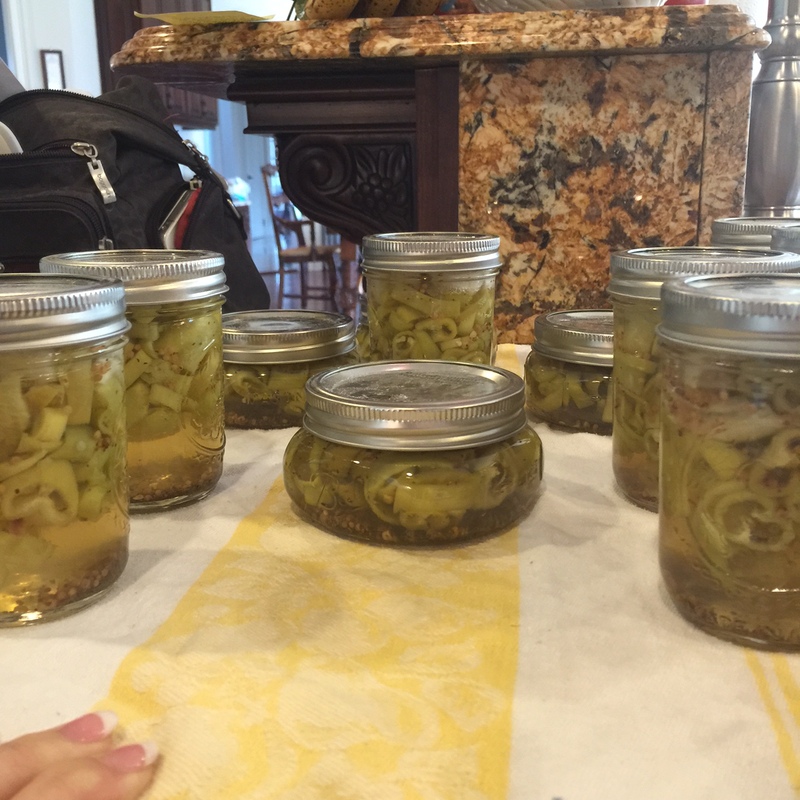 Half pint jars and lids (the amount depends on the weight of your peppers. 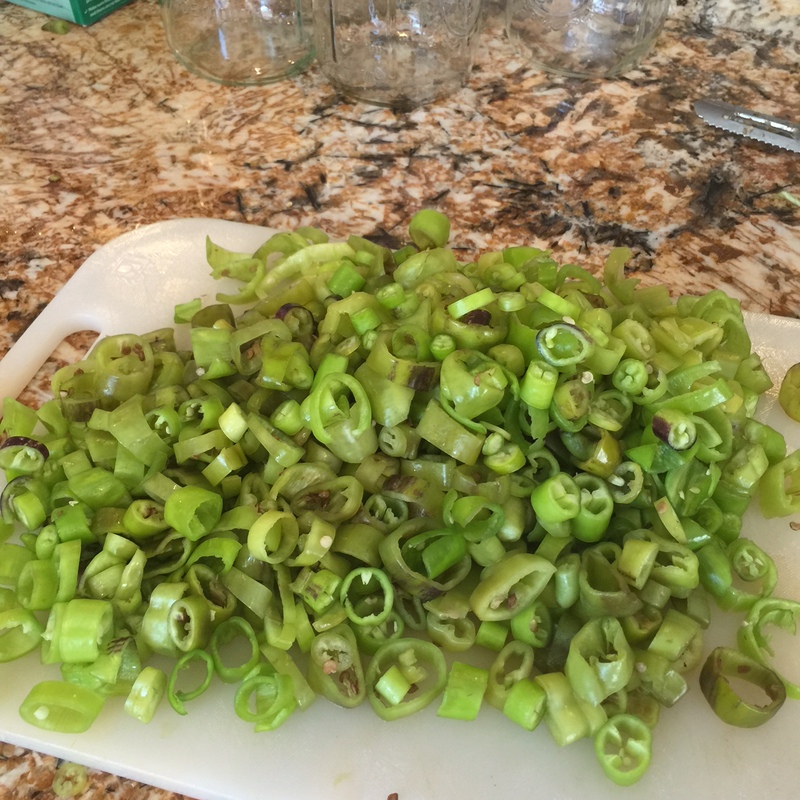 1/2 pounds of banana peppers– (I was able to harvest almost 3 pounds today. If you have a few plants you will be surprised how many you can work with). If you have 1/2 pounds of peppers you will get about 2 1/2 pints out of it). Start water boiling in your pot to process your jars when done. Remove seeds and membranes from peppers (throw these in the compost.) Cut crosswise to make rings. Bring all the ingredients–except peppers– to a rolling boil. Remove bay leaves if you want too. I usually leave them in because they won’t affect the flavor negatively and they look really pretty in the jars. pack the jars with the pepper rings and pour the hot brine over them until the peppers are covered and there is 1/2″ of headspace. wipe the rims and threads with a wet paper towel. Put lids and rings on fingertip tight. Carefully lower into boiling water and bring back to a boil. Process for 10 minutes. Lift out and let set for 12-24 hours. Enjoy the “popping” sound as your seals are formed. Once cool– label and plan your next pizza/cheeseburger/hotdog extraordinaire! ← Make at Home Echinacea Tincture– Strengthen Your Immune System Naturally. We have to try this. The family has talked about doing this with other vegetables too. They are so fresh and without all the additives that you find in many brands. They are such a fun condiment to so many dishes. Your garden must be spectacular if you can grow veggies in it. So nice to have met you in the blogosphere! Awesome! Will buddy up with you on that! Take care.